1 pair of zori straps : fabric, cotton, twine ; each 6 x 1.5 (circumference) in. Yellow straps for goza zori with pattern of rosy pink flowers, green leaves, and purple outlined ribbon bows stuffed with layers of fabric, paper, & cotton batting and twine; matching fabric toe loops to anchor to front of zori. Twine extends out from straps for anchoring to sides of zori. Two pieces: right (A) and left (B) side. Made for everyday zori with goza matting. 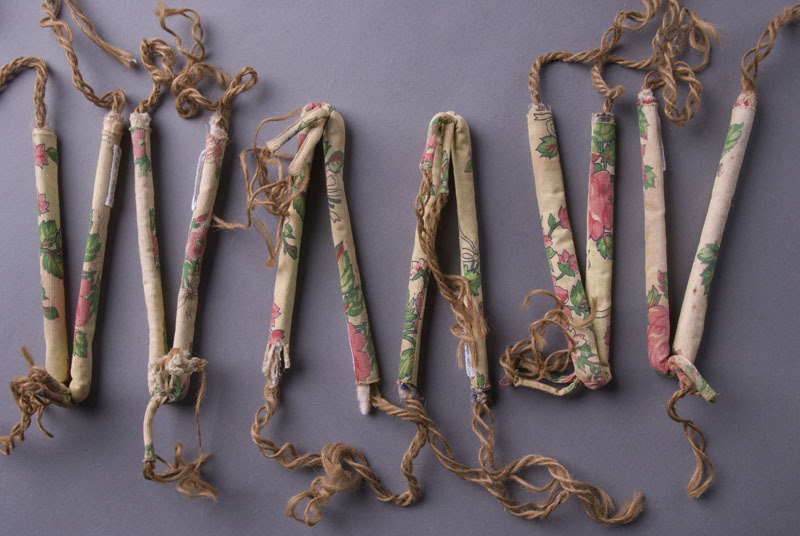 Issei women utilized every little scrap of fabric, also "strings" used to tie grocery bags at the plantation store in the 1920-1930's. Nothing was wasted. Otherwise, they couldn't have survived on such meager wages.